Last year we didn't hold this workshop as most of the Friday morning volunteers had already attended in previous years. We now have several new volunteers so it is being held again. This year Dinah Hansman will be talking about how to identify trees from their leaf features and Peter Snodgrass will be showing the different seed types and explaining how to germinate and grow them. The workshop is held in two sessions separated by a morning tea provided by TREAT. The workshop is free and open to anyone, but places are limited, so please register with Barbara Lanskey (ph 4091 4468) if you wish to attend. It is scheduled to finish at 12.30pm. This free workshop is held at Freemans Forest Nature Refuge near Lake Eacham, on Cutler Road off Lake Barrine Road, where hole digging and planting can be demonstrated. There is an initial information session held in the shed, to talk about what is involved in site preparation and maintenance as well as the actual planting of trees. Mark and Angela McCaffrey and Peter Snodgrass will give the latest information on herbicides and other methods of grass and weed control, plus fertilisers. Notes are provided. A morning tea is held between the information session and the demonstrations. The morning usually finishes about midday. Please register with Angela McCaffrey (ph 4097 2426) if you wish to attend this workshop. The Christmas break-up party will be held on Friday 14 December. TREAT buys some platter goodies for the occasion and members often bring special fare as well. The QPWS staff from next door come over and we all indulge in convivial company and conversation until most of the food disappears. It's a time when we hope members we no longer see often, will come and say hello again. The nursery will still be open for a working bee on Friday 21 Dec. but will be closed for the Christmas - New Year period. Working bees start again on Friday 4 January. Fungi - What are They Doing in our Bush? Have you given TREAT your email address to receive the newsletter electronically? Membership renewal falls quarterly, in line with the newsletter production months of January, April, July and October. If your membership is due you will receive an email to advise you of this. This will be sent approximately 1-2 weeks after release of the newsletter. Members receiving a paper newsletter will receive a red dot on the address label. Memberships are important to us. They help fund the administrative costs and materials required for TREAT activities. Since the change to the e-newlsetter our postage costs have reduced dramatically, but we still have the costs of artwork and printing for the newsletter. If a membership lapses for 12 months or more we remove the membership from the current membership database but lapsed members are always welcome to renew. Membership fees remain at $15. Multiple year subscriptions are also welcome (maximum of 3yrs). If you have any queries about your membership please email Mandy at treatinc@bigpond.com. Healthy ecosystems are networks of species sustainably interacting with each other in their environment. If you agree that one of the aims for vegetation restoration is healthy and resilient bushlands, then we hope the following outline about the many roles of fungi will help you deepen your understanding. The 'bodies' of most fungi are networks of fungal threads called mycelium which tirelessly perform their essential work all year round. We only notice fungi when they produce fruiting bodies such as mushrooms, puffballs and other amazing fungi forms, collectively called macrofungi as they are easy to see. Equally important are microfungi which are smaller and less easily seen, even their reproductive structures. These are microscopic, as is the fungal mycelium which grows in or on the substrate. Remember it is the mycelium that carries out the ecological functions of recycling, parasitising or acting as mates to the plants and other species. Recyclers, also known as rotters or saprotrophic fungi break down nutrients from dead organic matter and together with other microbes like bacteria play an essential part in the nutrient cycle. These and other fungi also play an ecological role as a source of food, for mycophagous (fungus eating) invertebrates which feed on both fungal mycelia and fungi fruit bodies. 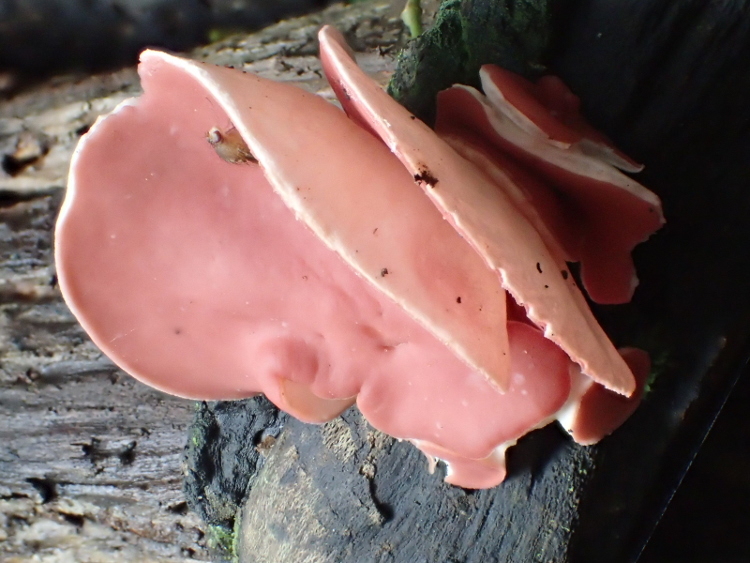 There are many fungi which live on or together with other living things. These relationships are beneficial to all and are called mutualisms or symbiosis or partners or 'mates'. These are mycorrhizae, fungi endophytes and lichens. Mycorrhizae deserve an article of their own to explain the extensive range of their relationships. Mycorrhizae collectively are beneficial fungi that live on the roots of plants. This connection with the roots of many Australian plants, is mediated by mycophagous animals, particularly marsupials such as bettongs, bandicoots, potoroos and the more generalist macropods. The fact that most of these mycophagous animals have been removed from most Australian habitats over the last century or so has had deleterious effects on the long-term health of Australian vegetation. Before European settlement, mycophagous animals ate the truffle-like and other fruiting bodies and by doing so spread the spores of the mycorrhizal fungi to the benefit of the animals, the plants and the fungi. The loss of these animals as vectors for dispersing mycorrhizal spores has caused the loss of local diversity among mycorrhizal fungi which in turn has reduced the success of symbiotic associations with plants, and hence reduced the health and long term resilience of the plants and their ecosystem. We are only just beginning to understand the complexity of the myriad relationships that plants have with fungi. In addition to mycorrhizae we are now realising that fungi can be found in healthy plant tissues where they are called endophytic fungi (fungi that live inside plants). We have recently learned that endophytic relationships give benefit to plant hosts including improved drought tolerance and disease resistance, while for grasses helps discourage grazers by altering the taste. We previously assumed that the great diversity of cup fungi called 'discomycetes' found fruiting on wood were all recyclers, but thanks to molecular tools we now know that some of these disc and cup shaped fungi are the reproduction stage of endophytes whose host has died. As a result they fruit on the forest floor where their spores can partner with new seedlings, for example this colourful Phillipsia subpurpurea. Fungi are a component of lichens which contribute to capture of carbon (primary production) in ecosystems. Lichens are mutualisms of fungi with either algae and/or cyanobacteria. Lichens, soil fungi and other cryptogams (mosses, liverworts, hornworts, algae and cyanobacteria) are particularly important in arid environments where cryptogamic crusts hold the soil together which helps prevent erosion and improves water infiltration as they act like a sponge. In rainforests cryptogams are often epiphytes, holding moisture, creating moist microclimates. Lichens are important in the canopy and on the tree trunks in forest systems where they serve as habitat for a myriad of microbes and invertebrates. Some of the lichens found on trees partner with cyanobacteria. These 'cyanolichens' are important to the nutrient cycle as the cyanobacteria capture atmospheric nitrogen and convert it in to a bio-available form for use by themselves and their fungal partners. 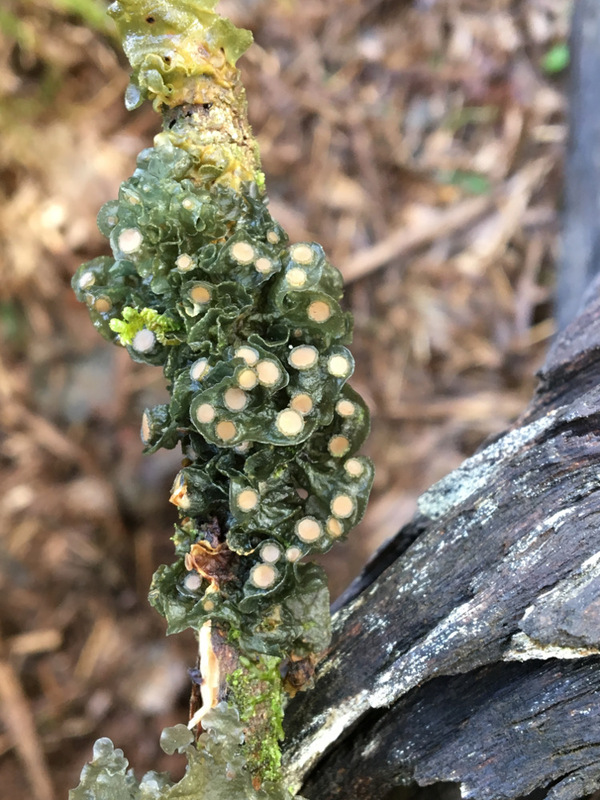 This nitrogen is water soluble so when it rains or is 'cloudy' some of this nitrogen leaks through the lichen and becomes available to other surrounding plants. Relationships that fungi have with living things may be neutral or cause slight or great harm to one of the partners: these are called parasites. Successful parasites do not kill their hosts, rather they live off their hosts for long periods of time ranging from decades to hundreds to thousands of years. 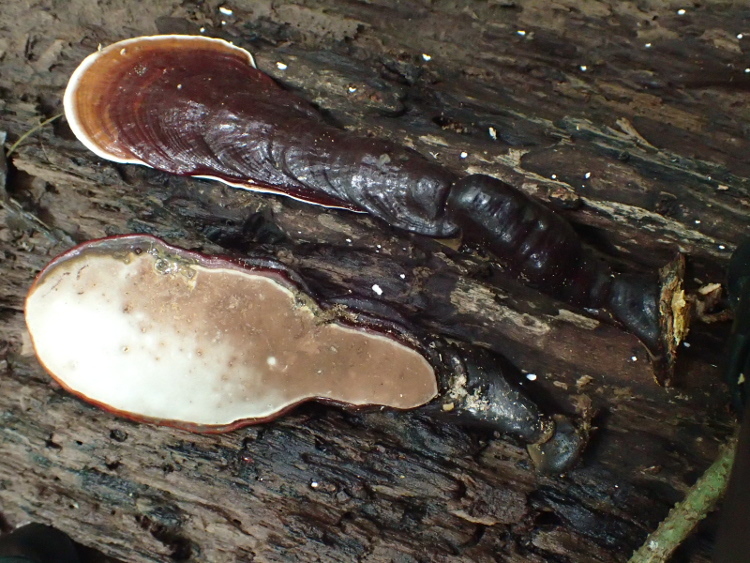 There are a relatively small number of parasitic macrofungi, these are often associated with trees, and include Ganoderma, Armillaria and some polypores. Parasites are important in ecosystems as in the short term they create gaps in ecosystems and act as population control if one species becomes too common. For many animals, these parasites are important as it is their actions which kill off a limb or portion of a tree, which start hollows that animals later use as homes. Research and conservation efforts are currently biased towards charismatic, larger common and rare organisms, in well-known groups such as birds, mammals, orchids etc. Unless there is a concerted effort to include less-well-known organisms in current management and monitoring efforts, these will continue to be poorly known and understood. Given the important functional roles of these organisms, a lack of knowledge may have disastrous consequences. We are currently writing a practical guide for Australian land managers to assist them to discover the vital roles fungi play in healthy ecosystems. Australian fungi are different from those in other countries just as our plants, animals and other species differ. Woefully, despite this, Australia still lacks a practical guide for land managers in conservation and restoration focused management. We have recently successfully used crowd funding to raise the money we need to write our core guide. Over three hundred people generously supported our crowd funding campaign and now the core book is being written by Sapphire with assistance from Roz, mycologists and land managers from around Australia. Once the core material has been written, we will then edit, compile images and diagrams and layout the book ready to be published. We are still fundraising for the latter and so ask for your help to get it published and in the hands of the people who need it. Please check out our project page https://www.funfungiecology.com/fungi-for-land/ and our facebook page https://www.facebook.com/Fungi4Land/. We would appreciate your sharing this with interested contacts to help us raise awareness of our project. Thirty-eight people (with 12 apologies) were welcomed by President Angela McCaffrey on the evening of 7 September at Yungaburra Community Hall. Minutes of the 2017 AGM were read by Secretary Doug Burchill and accepted by members. The Treasurer's report for 2018 (prepared by Treasurer Mandy Bormolini) was presented by committee member John Hardman. 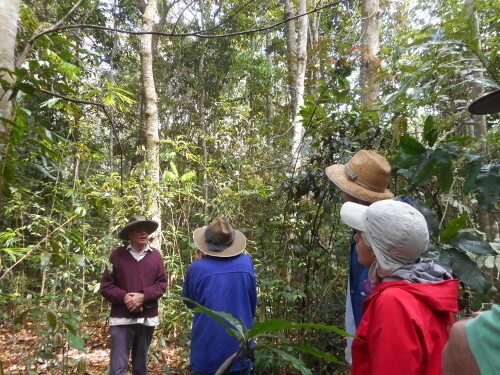 The QPWS Restoration Services Lake Eacham Nursery report was presented by Acting Ranger in Charge, Peter Snodgrass. Angela presented her President's report and then declared all TREAT Committee positions vacant and invited Alan Gillanders to proceed with the election of office bearers for the next year. The list of nominees had been emailed to members in August. The mobile display board from the nursery that listed all the names of nominees was presented. After a call for nominations for one remaining committee position (which was unsuccessful), Alan declared the nominees as presented, be duly elected. Simon Burchill, Ingrid Clark, Trish Forsyth, Irene Gorman, Dinah Hansman, Barbara Lanskey, Dave Skelton. After the following General Meeting closed at 8.20 pm, guest speaker Paul Hales gave a presentation on the work of Bush Heritage on Yourka Reserve, which he manages. Bush Heritage Australia identifies and focuses on 'priority landscapes' where there are conservation assets of national importance and they can make a significant difference. They invest in these sites through purchases and partnerships with others, including Cape York traditional owners. Sites are now under Reserves all around Australia (see map at www.bushheritage.org.au). Yourka Reserve is 43,500 hectares 130 km south of Cairns on the Einasleigh Uplands, abutting the Wet Tropics area. It is situated in the traditional lands of the Jirrbal and Warrungu peoples. It contains a variety of ecosystems from wet eucalypt forests, open woodlands to riparian woodlands, comprising of nearly 300 plant species. Its pastoral history didn't involve large scale clearing but through disturbance by stock and vehicles, weeds have been introduced including siam weed, grader grass and lantana. Fire planning and management play an important role in regenerating tree and shrub species and control of weeds. Feral pigs also need active management. Biological surveys and targeted surveys for rock wallabies and quolls continue to be carried out with help from naturalists, volunteers and National Parks staff. A convivial supper ended the evening. It has been a quiet but momentous year for TREAT. I say momentous because after at least 20 years we have finally completed the planting of the Peterson Creek Wildlife Corridor. There are still a few years of maintenance and monitoring to see how it grows and what uses it, but the planting stage is over, barring any infill we decide on in the future, and that should be celebrated. This year has also seen a better wet season than in recent times coupled with a mild winter so tree plantings on most sites look strong and settled. The nursery continues to produce thousands of healthy seedlings due to the sustained efforts of regular and occasional Friday morning volunteers, be they cleaning seed, potting up, sterilizing pots, weeding or helping with the morning tea. All are vital and appreciated. The QPWS staff Nick and Pete assisted this year by Stuart Russell, Matt Kempe and Simon Brown do an amazing job to ensure we have sufficient top class seedlings for each regional ecosystem. TREAT organised volunteers for 12 plantings where a total of 22,500 trees were planted, of which 8,600 came from the QPWS/TREAT nursery. Other trees came mainly from the TRC revegetation unit, NQLMS or from landholders' own nurseries. Barbeques were provided at 9 sites with alternative catering arrangements made for the other 3. These were followed up by the application of frost guards at Michael Hoare's and regular maintenance. I thank all the volunteers, contractors, landholders, and funding bodies involved in making these plantings successful and keeping them growing strong and healthy. Further, a total of 6,580 trees were provided by TREAT to members to plant themselves. We took a break from the usual Tree ID and Propagation Workshop but continued the popular Planting Workshop which was well attended by people who learnt how to prepare their sites, plant and maintain trees for the best success. In March, with the help of the Queensland Mycological Society, we held a fungi workshop where we studied and learnt how to photograph fungi for identification purposes. It is hoped that we can repeat this workshop next year and assist with the production of a Wet Tropics fungi field guide. We held only one field day this year - at Cloudland NR on Seamark Rd, thanks to Dave Hudson and Robyn Land. We looked at well established planted trees as well as the Kick Start trial areas with newly planted sections, followed by afternoon tea put on by Robyn and Barbara Lanskey. This year, TREAT assisted the CSIRO with the measurement of carbon in riparian tree plantings over 5 years old. Scientists came from Canberra to measure the trees whilst volunteers interviewed landholders about the conditions prior to and after planting. The results are to be used by the National Environmental Science Program. On a similar theme, our own carbon project continues with work being done by Dave Hudson, Cath Moran and Dave Skelton to document the process of securing ACCUs on an area planted in 2017 at Freemans Forest NR so that tree planting community groups can make informed decisions about obtaining carbon credits, the work and costs involved and the financial outcomes they can expect. The report and 'how to' guide from this work will be available shortly. The rainforest display centre at the nursery continues to be open every Monday, Wednesday and Friday and has been staffed each week by volunteers Bob Morrison, Belinda Swanson, Linda Joncour and others who have stepped in at short notice. Thanks to all. We have continued to have a stall at Yungaburra Markets about 3 or 4 times per year to build community awareness of TREAT's work and how people can help. Thanks go to Shirley Prout and helpers. Several new memberships have been picked up along with sales of books etc. Also, Barbara Lanskey looked after a stall to spread the word at Malanda Falls Visitors Centre on World Environment Day. Behind the scenes the running of TREAT continues smoothly thanks to our hard working committee and additional volunteers. I thank the outgoing committee for their dedication. Doug Burchill has been our secretary for many years and Mandy Bormolini our treasurer, Barbara Lanskey continues to produce our newsletters as well as organise workshops and field days including any catering that's required, and ensures the staffing of the Display Centre. Barbara has also taken on the education aspect of TREAT with Atherton After School Care and QPWS's Lake Eacham Nature Kids Club. Simon Burchill takes care of our website, Facebook page and monitoring plantings for condition, as well as keeping the committee informed on the latest weed information. Dave Skelton looks after TREAT's database on tree plantings and has assisted with the technical side of the Carbon Project. Dinah Hansman has handled our media coverage. John Hardman and Irene Gorman have contributed to discussion and decision making as did Alan Gillanders and Beth Smyth, who due to other commitments resigned mid-term and we wish them both well in their endeavours. Lastly I would like to especially thank Ken Schaffer who leaves the committee this year after 15 years dedication, having been both treasurer and vice president as well as taking on a variety of other roles. Ken looked after funding for infrastructure at the nursery, organising the new sterilizer, the aluminium benches, and the steel supports for the hardening-off bays, as well as setting up the BBQ trailer. Ken will continue to be a Friday morning volunteer. I complete this report by mentioning just a couple of celebrations during this year. Firstly, the block of land on Cutler Rd which we usually call 'Ian's Block', now owned by SET, formally became a Nature Refuge called Freemans Forest NR and Ian's family came to join in the signage unveiling. Next, TREAT was awarded the Chair's Award at the 2017 Cassowary Awards in March, and lastly, a 20 year milestone was reached in plantings at Massey Creek as part of the East West Walter Hill Range Corridor, as well as the already mentioned completion of the Peterson Creek Corridor. So with that in mind, I end where I began by saying it's been a momentous year, and we look forward to the next one with much enthusiasm. 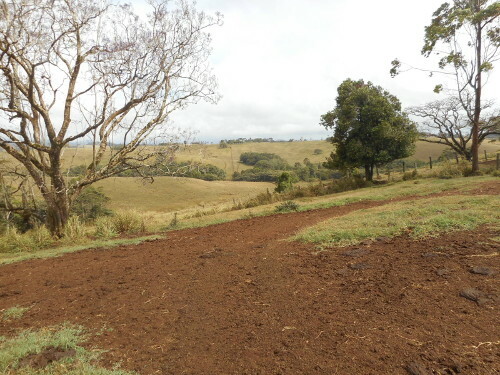 Malanda Landcare held a meeting and field day at Ross Chapman's property on 23 September and I attended, keen to look at Ross' creek revegetation, as I remembered seeing my first tree-kangaroo there many years ago on a TREAT field day. We met at the machinery shed next to the dairy and Ross had some old photos to show us. The land was originally cleared for dairying in 1911 and Ross' parents bought the farm's first block in the early 1960s. It has been added to over the years and Ross and Wendy still operate the dairy, running 250 head with about 40 milking cows. 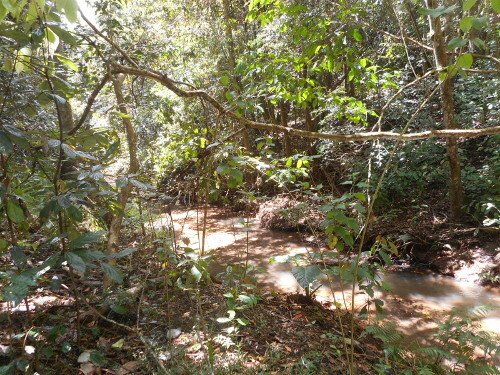 There are approximately 2 km of revegetated creek lines (one 'creek' being the North Johnstone River) and about 30,000 trees have been planted, which equates to 10 ha of riparian zone. The revegetation has been accomplished by various groups with funding from various sources and Ross has spent much of his own money, on the river crossing construction, fences and off-creek watering points etc. Ross took us first to an area called Dingo Pocket, across an un-named creek. This is where the first planting was done, in 1991, by the Wet Tropics Tree Planting Scheme, the first morph of the Tablelands Revegetation Unit. It was very early days in learning what works best for revegetation and Ross said that over subsequent years about half the trees were replanted. It was looking good with lots of tall trees and recruit seedlings. Being an older planting, it has been the subject of many research projects about tree growth, dung beetles, carbon sequestration etc. We then drove across the Johnstone river and up to the top of a hill where a group of trees were planted as shade and shelter for stock. Here the original fence was opened for the cows to walk in among the now mature trees. This was another research area, this time estimating soil nutrient loss - just over the ridge is Bromfield Swamp. It was a great viewing point from where the creek line revegetation was easily seen from south to north. Farm view with revegetated creek lines, Area planted in 1991, Johnstone river downstream of the confluence with an un-named creek. Before going back across the river, Ross took us upstream to see the confluence of the un-named creek with the river. Interestingly the creek water is always clear whereas the river water is cloudy. Many think the cloudiness is due to the water leaching through the volcanic ash in the landscape near Bromfield Swamp. Near where we parked the cars was a bank which had slumped and some bigger fig trees were holding the top of the bank together. In earlier days when vegetation was cleared to the water line, some trees got left on the steepest banks. Further upstream we looked at a weir constructed in the early times for pumping water up to the dairy. It now simply reduces water velocity during floods as Ross uses a bore near the dairy for all his water needs. Back across the river, Ross showed us a small, slow-growing tree with very dense wood, then took us to where people used to be able to walk across the river, on thick mats of para grass. With forest now growing on either side, the grass has been shaded out and the water level is much lower and free-flowing. Then it was time to return for some lunch and the meeting to follow. It was nice to have fresh cow's milk available for our tea and coffee. The cows also thought it was lunch-time as they'd smelt the lucerne in the back of Ross' ute and followed us. Ross and Wendy are justly proud of their wildlife habitat in conjunction with their dairying and are an example to follow. I didn't see a tree-kangaroo (there are 15 - 20 on the property) but I had a most informative and enjoyable morning. Another year and another AGM are behind us, and a re-structured TREAT committee and another year of great projects to schedule into the work program are ahead. I am relieved to inform you all that I have Simon Brown's appointment with the nursery extended through until the 1st of February at this stage, which will be of great support to our work program. We will all be moving into new areas for ecosystem restoration and connectivity this year with Peterson Creek mainly finished and moving into new areas within the Massey Creek section of the Tully Gorge National Park. The dry weather is testing the newly established sites, so hopefully we get some early storms to assist with ground moisture and their survival. The dry conditions make site preparation difficult but regardless, we still need to prepare for the upcoming planting season and I hope all goes according to plan. Species and Common names are taken from 'Australian Tropical Rainforest Plants' online key.